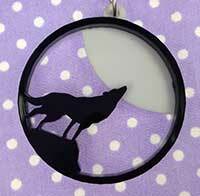 Each one of our pendants is hand made individually. We cut the separate parts from white and black acrylic with are laser. A special glue is used to weld these separate peices together Size info: 40mm in diameter 6mm depthChain: 20" silver plated and has a bolt ring to fasten.